The '10 Things I Hate About You' cast on working with Heath Ledger. 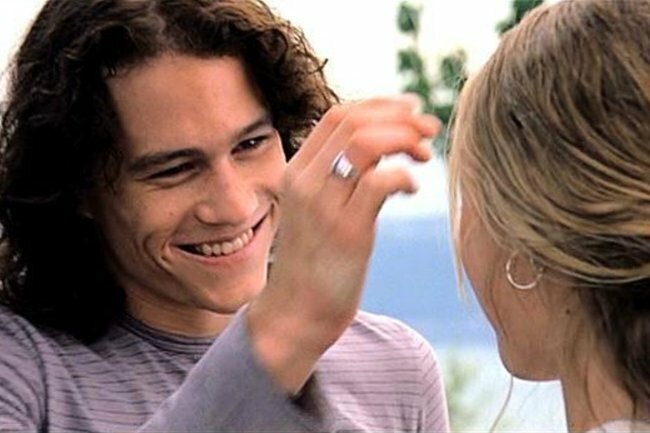 It has been 20 years since the world was introduced to the cheeky smirk of Heath Ledger in 10 Things I Hate About You – a film that has since become one of the most iconic teen movies of the 90s. The timeless film was based on Shakespeare’s classic ‘Taming of the Shrew’, centred on the love story between the difficult Kat Stratford (Julia Stiles) and bad boy Patrick Verona (Heath Ledger). To celebrate the film’s anniversary, the cast and crew of the classic cinema piece are reflecting on what it was like on set, and remembering their cast-mate, the late Heath Ledger, who tragically passed away from an accidental drug overdose in his New York apartment in 2008. Talking with The New York Times, Director Gil Junger shared how Ledger, an Australian actor, thought he had done badly in the audition when in fact he had nailed it. Gabrielle Union, who played popular girl Bianca’s friend, Chastity, shared the unique ability the actor had in making you feel special. “Heath had the ability to look at you, and [make] you feel like Princess Diana. In a very crowded Hollywood landscape, he could make you feel special and seen,” Union said of Ledger. Heath Ledger and Julia Stiles at swing in a scene from the film &apos;10 Things I Hate About You&apos;, 1999. Image via Getty. Julia Stiles shared that during the scene in which her character Kat reads the poem to Heath&apos;s character, Patrick, there was a moment that has stuck with her for it showed Ledger&apos;s humility. "I remember Heath, when they turned around to do his reaction shot, he said something like, &apos;I don’t need to do anything because this isn’t about me.&apos; A lot of times you get one actor crying in a scene and the other actor feels like they have to cry, and he knew to be sort of restrained. I thought that was really cool." Proving his creative talent as well as kind personality, the cast and crew also remembered that it was in fact Ledger who chose the song for the iconic scene scene where he tries to impress Kat at her soccer practice with Frankie Valli&apos;s "Can&apos;t Take My Eyes Off of You". Script co-write Karen McCullah shared: "The first song we had in the script was &apos;I Think I Love You.&apos; Then we decided on &apos;I Touch Myself,&apos; and I think Heath decided that that wasn’t romantic enough, so he chose the Frankie Valli song, which was a much better call."